Seguro Social, México City, México; 2Facultad de Química, Universidad Nacional Autónoma de México, México City, México. Received June 4th, 2011; revised July 28th, 2011; accepted August 16th, 2011.
make it a strong candidate for future clinical applications. Charleston, Inc, USA) and were kept at –70˚C until use. 1.077) and centrifuged at 700 × g for 30 min at 21˚C . was isolated was 95% pure. 12-myristate 13-acetate (PMA) (Sigma, Chemical Co, St.
tochondria) to a final concentration of 1.5 × 106 cells/ml. Kit) (Calbiochem® Merck KGaA, Darmstadt, Germany). microplate reader (Dynatech MR 5000, Maryland, USA). or sample was added to each well and incubated for 2 h.
ments was considered to be the final concentration. cells were simultaneously stained with annexin V and PI. per left quadrant; apoptotic-necrotic ce lls, in the upper right quadrant; and early apoptotic cells in the lower right quadrant. same is not necessarily true with initiator caspases. stronger between the PMA and actinomycin D.
are indicated with an asterisk , p < 0.05 (Mann-Whitney test). 0.0001 and p < 0.01 respectively). NS = no significant difference, n = 6, p < 0.05 (Mann-Whitney Test). produced by necrotic cell death . implicating the intrinsic apoptosis signalling pathway. stream, creating a proteolytic amplification cascade. logical Reviews, Vol. 165, No. 1, 1998, pp. 279-285. Nature, Vol. 398, No. 5, 1999, pp. 756-757. 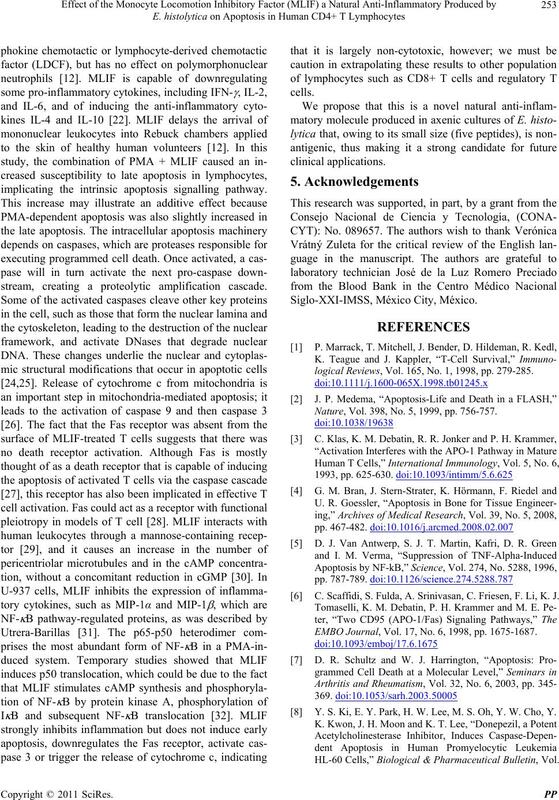 C. Scaffidi, S. Fulda, A. Srinivasan, C. Friesen, F. Li, K. J.
EMBO Journal, Vol. 17, No. 6, 1998, pp. 1675-1687. Y. S. Ki, E. Y. 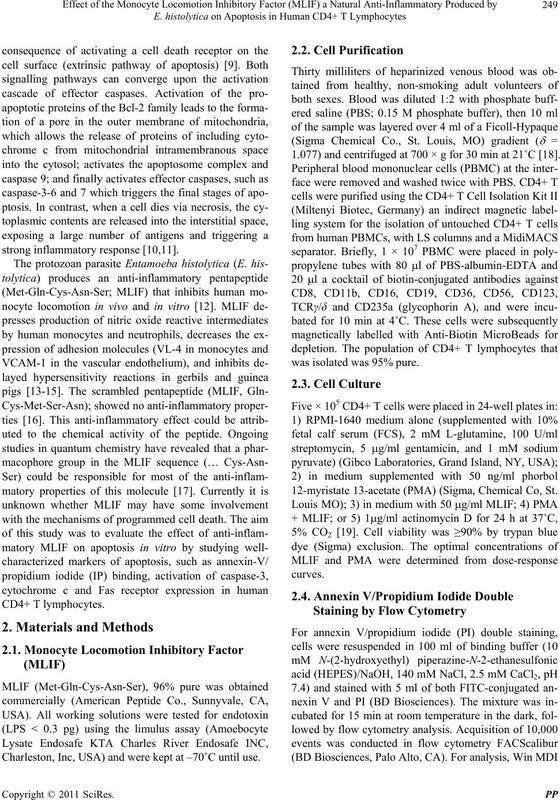 Park, H. W. Lee, M. S. Oh, Y. W. Cho, Y.
HL-60 Cells,” Biological & Pharmaceutical Bulletin, Vol. 33, No. 6, 2010, pp. 1054-1059. Vol. 25, No. 9, 2003, pp. 2013-2026. 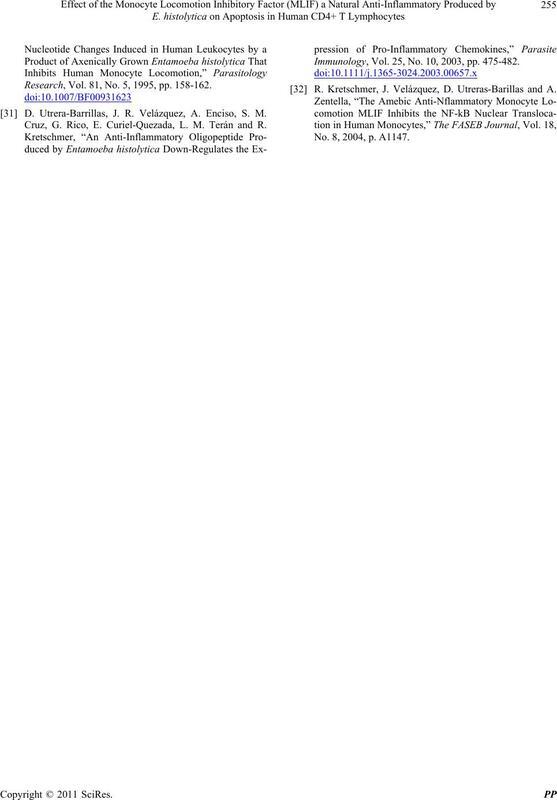 Cells,” Cellular Immunology, Vol. 266, No. 2, 2011, pp. 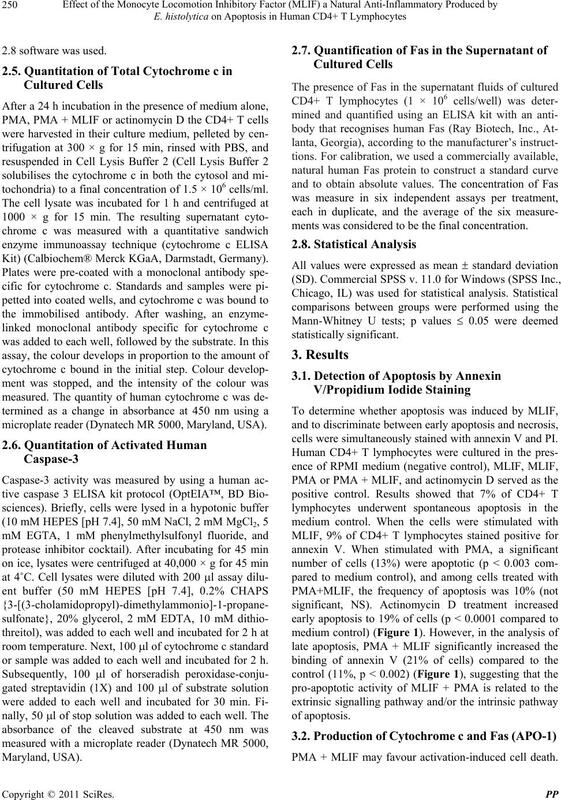 T. Miyawaki, T. Uehara, R. Nibu, T. Tsuji, A. Yachie, S.
Immunology, Vol. 149, No. 11, 1992, pp. 3753-3758.
ogy, Vol. 7, No. 5, 1985, pp. 527-543. G. Rico, O. Diaz-Guerra, J. A. Giménez-Scherer and R. R.
chives of Medical Research, Vol. 23, No. 2, 1992, pp. G. Rico, E. Leandro, S. Rojas, J. A. Giménez and R. R.
tology Research, Vol. 90, No. 4, 2003, pp. 264-267.
moeba histolytica,” Archives of Medical Research, Vol. 28, No. 4, 1997, pp. 237-238. J. A. Giménez-Scherer, G. Cárdenas, M. López-Osuna, J.
R. Velázquez, G. Rico, A. Isibasi, M. C. Maldonando, M.
Immunol, Vol. 26, No. 8, 2004, pp. 343-349. C. Soriano-Correa, J. F. Sanchez-Ruiz, G. Rico-Rosillo, J.
 R. Freshney, “Scaling-Up of Animal Cell Cultures,” In: D.
Cell, Vol. 94, No. 6, 1998, pp. 695-698.
thology, Vol. 117, No. 1, 1984, pp. 71-80. S. Rojas-Dotor, G. Rico, J. Pérez, J. Velázquez and R.
search, Vol. 98, No. 5, 2006, pp. 493-495. Vol. 42, No. 4, 2009, pp. 415-425. Vol. 169, No. 5, 1989, pp. 1747-1756.
tosis,” Science, Vol. 245, No. 4915, 1989, pp. 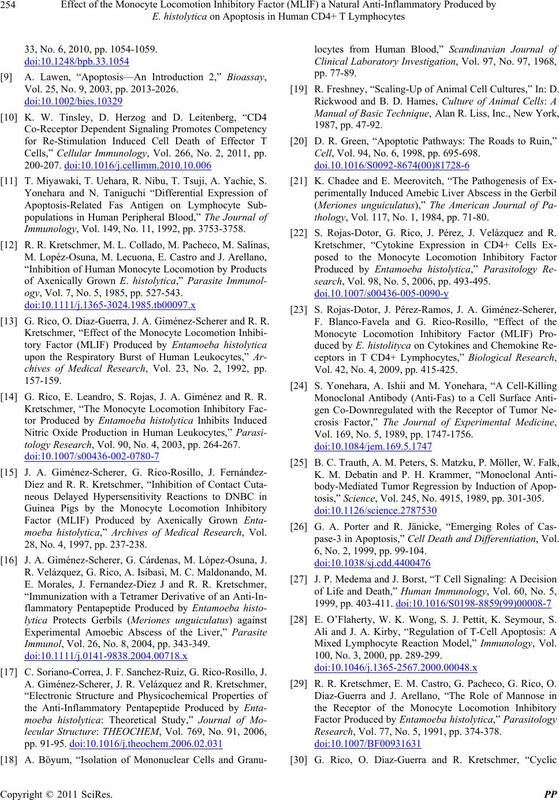 301-305.
pase-3 in Apoptosis,” Cell Death and Differentiation, Vol. 6, No. 2, 1999, pp. 99-104. 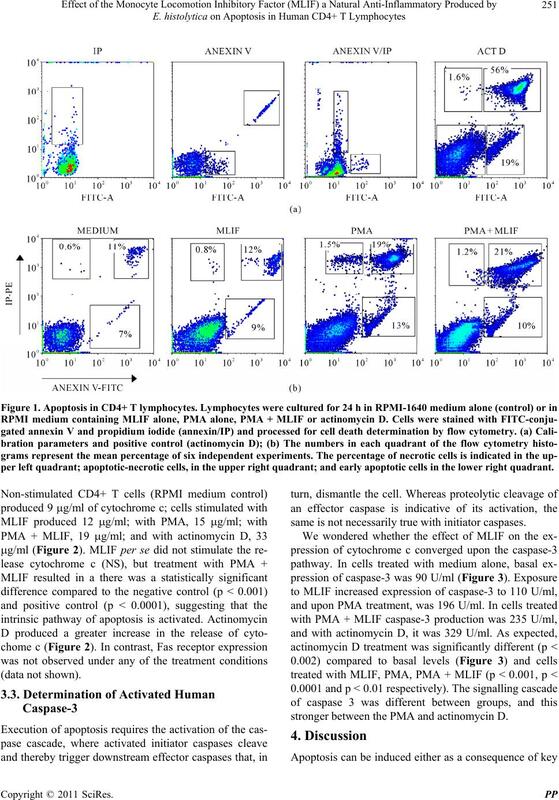 E. O’Flaherty, W. K. Wong, S. J. Pettit, K. Seymour, S.
Mixed Lymphocyte Reaction Model,” Immunology, Vol. 100, No. 3, 2000, pp. 289-299. R. R. Kretschmer, E. M. Castro, G. Pacheco, G. Rico, O. Research, Vol. 77, No. 5, 1991, pp. 374-378. Research, Vol. 81, No. 5, 1995, pp. 158-162. 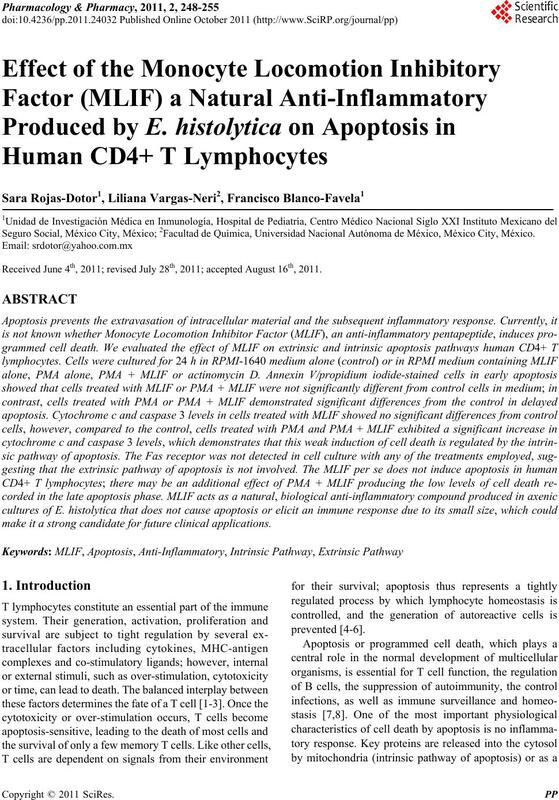 D. Utrera-Barrillas, J. R. Velázquez, A. Enciso, S. M.
Cruz, G. Rico, E. Curiel-Quezada, L. M. Terán and R.
Immunology, Vol. 25, No. 10, 2003, pp. 475-482. R. Kretschmer, J. Velázquez, D. Utreras-Barillas and A. No. 8, 2004, p. A1147.